Capture attention; Strike up a conversation ! During a promotional tour in a home renovation store, a dominant Gaz Metro module was showcased. Two strong elements reinforced the Hot Water theme; an ancient bathtub and a fake shower. Both of these are present as visitors walk by the mirrored wall. 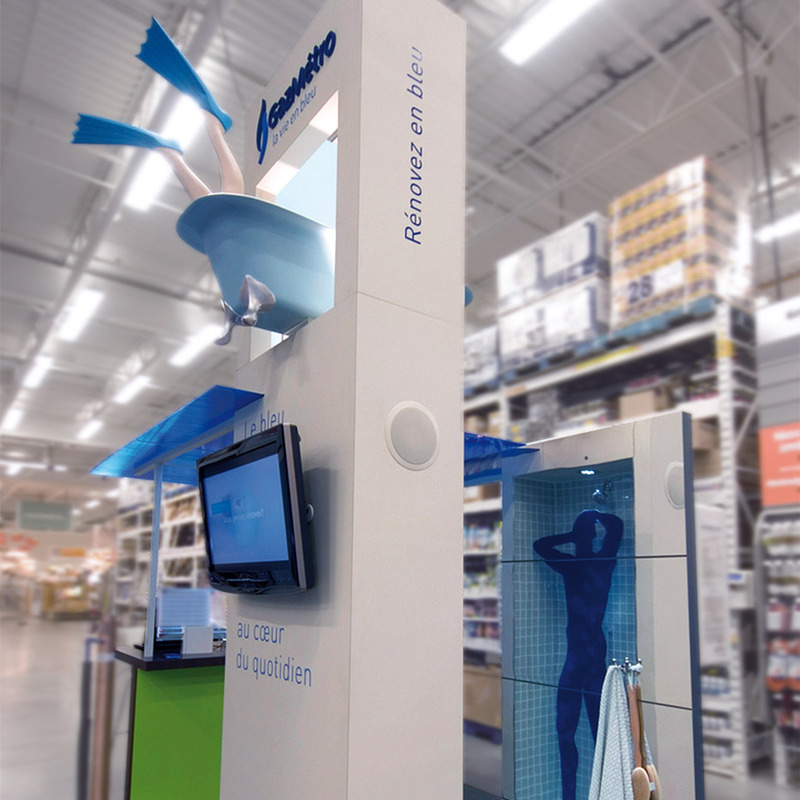 An informative module displays a water heater, and a company representative oversees both spaces, allowing for effortless interaction with clients and staff. The challenge was to draw the attention of store customers, present Gaz Metro services and adaptable solutions, collect information on potential clients, while being limited with a very compact space of 60 sq ft. A big challenge for a small space that required a clever strategy. Using the total allowable height of 12 ft, we made sure to create a highly effective visual impact from close or far. We sprinkled the kiosk with humoristic touches to lighten the ambiance and encourage communication with visitors. 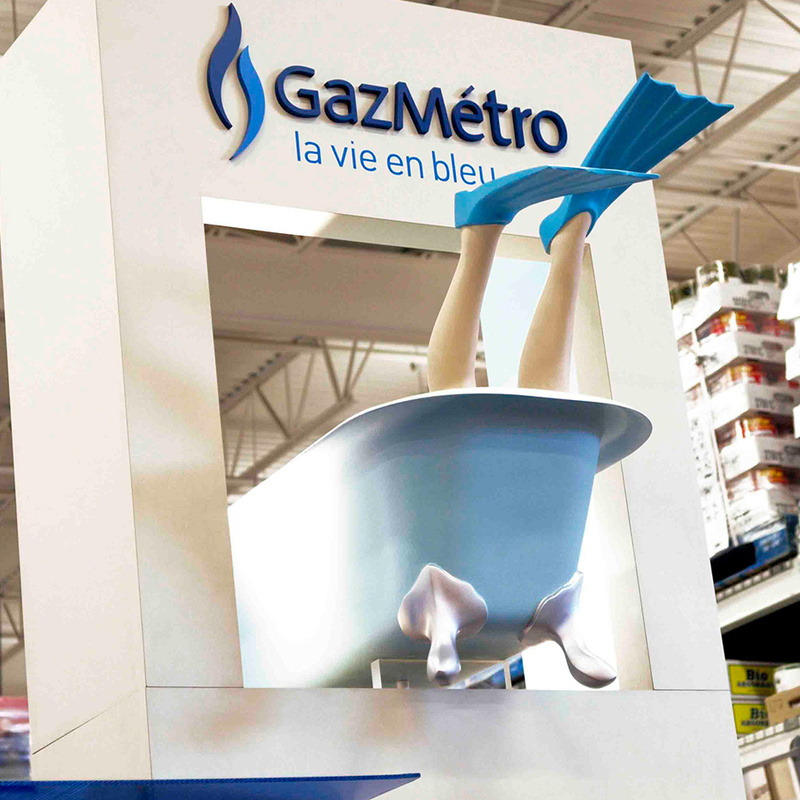 A soundtrack of kids playing in water, a bathtub filled with bubbles and a silhouette taking a shower brought a human element and helped Gaz Metro engage with a large number of interested potential customers.